A recent addition to the new QCF qualifications introduced by City & Guilds, the 6187-31 provides a level 3 CPD pathway to developing an in depth knowledge of ammonia which goes beyond the basic refrigerant handling skills available in the 2078-02 award. Delegates can follow either a Service and Maintenance or an Installation and Commissioning route. This course is only suitable for experienced engineers who have regular access to ammonia plant. 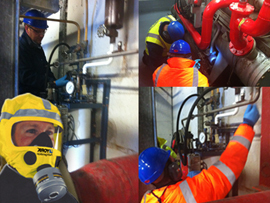 To achieve the City and Guilds 6187-31 Ammonia Level 3 qualification following either the Installation and Commissioning or Service and Maintenance route. • 2 - 3 weeks actual 'contact' time during which a range of tuition will be given including power point presentations, practical work, assignments and the development of a portfolio. Access to ammonia plant will be required for part of this time. • Self study time - an agreed time period between training sessions to allow evidence to be gathered and study to be completed. • Unit 318 Understand Ammonia Refrigeration Systems Installation and Commissioning Techniques - 11 credits. Assessed by means of an externally set, internally marked, multiple choice question paper. • Unit 322 Install and Commission Ammonia Refrigeration Systems - 3 credits. Assessed by means of a portfolio. Delegates must already hold their City & Guilds 2078-02 Ammonia Refrigerant Handling qualification although this can sometimes be taken during the course. This course is always held on site and as well as access to an ammonia plant a classroom or equivalent will be needed for the presentations and paperwork.